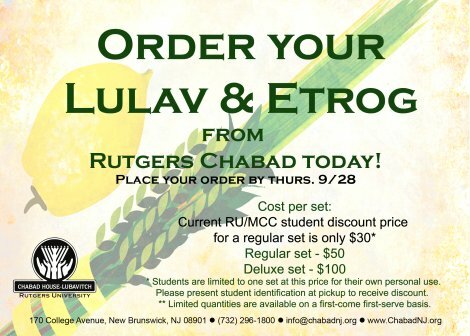 Please place your order no later than Thursday, September 28th (8th Tishrei) at 3:00pm. Monday, October 2nd (12th Tishrei), and Tuesday, October 3rd (13th Tishrei) from 10:00 AM to 2:00 PM. * Students are limited to one set at this price for their own personal use.